HVY Glass is a borosilicate glass art company based in Los Angeles. 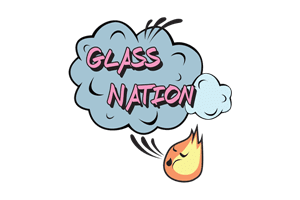 Firstly, Glass Nation is committed to carrying the highest quality HVY bongs on the internet. Additionally, we strive to have a robust selection of not just the basics, but the most epic HVY bongs available. HVY makes the most amazing classic looking bongs around. All their products are 100% American made. They have a place right in the heart of LA where they make heavy glass art magic. HVY Glass really does have heavy heady glass art. They use a lot of marbles in their artwork. Most impressively, the marbles have flowers inside sometimes, implosions, or swirls as well. Anything is possible with HVY art. All of their water tubes are incredibly colorful. They spare no expense when it comes to adorning their thick glass bongs with loads of beautiful marbles. You surly will not be disappointed.